The Console Automation System CAS is used for all adt-audio Mixing Console Systems that are automation ready. A CAS Console Automation covers dynamic automation of fader and mute and snapshot automation as well. In addition, CAS is expandable with the CRS Recall system that is implemented with the 5MT-MR and MAGNUM V3 consoles. The Console Fader Automation offers 0.1 dB level accuracy, db linear over a range of more than 100 dB. The dynamic system can handle scan rates up to 1/4 frame. With a 25 frame time code, the console is updated 100 times per second. Up to 256 faders can be controlled by a single system. The CAS fader automation uses an event related storage principle, that stores only the alterations of the values. This principle requires high processing power, however, the mix data filles remain very small and the length of a particular mix is not limited. 8 MB of static RAM can hold more than 100,000 events. With a real world mix this means that several hours of continuous mixing is possible. The system accepts any time code value in the range of 24 h. There is no need to specify start and end of a mix. Just start working, the console automation takes care of the rest. The storage principle has another advantage. Since only changed data is stored, you can store just snapshots.Once a fader value is stored, there is no need to write it for the entire sequence unless you write fader movements. A stored console setting at the beginning of a mix remains valid until any number of faders have different settings. If there are no additional settings in the memory, the first snapshot is valid for the entire mix. Using this principle, you can work with 'marks'. Just write a short sequence of at least one valid time code frame on every point you want to have this setting. Then change the setting of the console and insert marks with the new setting. You can build up a complex mix just by dropping marks. The Console Automation offers many different mix modes. Besides ABSOLUTE, that stores the real scale value of the faders, there are RELATIV and UPDATE. The CUT mode writes and edits only the cut's and leave the fader values unchanged. Combined modes that process cut and fader at a time are also possible. CAS is a multiprocessor system, that uses three combined computers. The host is an industrial PC. The Slave CPU processes the fader data and hold the mix in a 8MB static RAM band. Interface Boards handle the AD/DA conversion and the analog I/O from and to the console. These components are mounted in the main frame. The Slave CPU stores and processes the mix data in an 8MB static RAM bank and handles the data transfer from and to the faders. The static RAM holds the mix data until it is expressly deleted. Power failure does not delete your mix. The slave CPU interacts with the host that displays the fader data, forwards commands from the keyboards and saves and loads the mix data. The Time Code controller is also part of the slave CPU. In addition, a standard computer monitor and a standard PC keyboard are necessary for the operation of the fader automation system. Any computer monitor with a minium resolution of 800 x 600 can be used. The monitor can be installed in the meter bridge of the console, however, depending on the local situation, any other position and size of the monitor is possible. 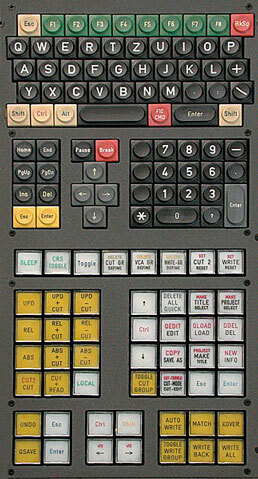 The CAS main screen shows the settings of 32 faders at a time. Status information, time code display and user interface are displayed as well. as a menue that is useful if no function keyboard is installed. In addition to the main monitor, a second, LCD type, monitor can be installed in the meter bridge of the console. This monitor shows status information, time code, file names and production data but no fader settings. The fader data is displayed on the CAS main screen, however, the size of the screen is limited. 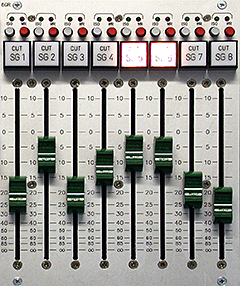 32 faders are displayed at a time. The screen can scroll thru the fader banks using the UP and DOWN keys. In addition to the display on the screen, the VCA position can be displayed on a LED chain next to the fader. This display is a hardware system, which is part of the particular fader module or input channel. See the description of the modules for details. Any standard PC keyboard can be used for the console automation. All functions are available thru function keys short cuts as well. Several special keyboards are available. These keyboards can be installed in the master section of the console. In addition to the standard keys there is a block of function keys that makes the operation of the system very easy. A second keyboard can be installed in parallel. Actually, the number of keyboards is not really limited. More than one function keyboard can be installed; one additional standard PC keyboard is possible. A software package that allows the user to change the assignment of the function keys is part of the system. For the dynamic operation mode, the Console Automation requires an LTC time code with 24, 25, or 30 frames per second, or dropframe.The Time Code Reader can handle any LTC format time code within a varispeed range up to 200 % with 30 frames per second time code. Time code drop outs are automatically compensated. The details of the compensation can be configured with the setup software.The main CAS screen displays the fader settings and the status. The CAS Console Automation System can handle VCA Groups in several different modes. Every single fader can be used as a VCA group master. In addition, static groups that use special group master faders and hardware VCA groups are possible. The picture shows a 8GR VCA Group Master Panel that can be used as static software group master or as hardware group master section as well. You can open a high resolution view here.